In search of lunch the other week in an unfamiliar section of District 1, The Astronomer and I were lured by the smell of grilled meats wafting through the air. There is no shortage of barbecued animal protein in Saigon, but on this particular afternoon, I found the smoky scent particularly tempting. I asked the gentleman closest to the storefront what dishes were on offer and he responded bun thit nuong and banh mi hap. We parked our motorbike, pulled up a seat, and ordered two bowls of bun and one order of banh mi hap. The bun thit nuong arrived first. The bowls were piled high with herbs, bean sprouts, lettuce, barbecued pork, scallion oil, crushed peanuts, pickled carrots and daikon, and a messy tangle of cool rice vermicelli noodles. Nuoc mam (fish sauce vinaigrette) was served in a small plastic container on the side. Of all the bowls of bun thit nuong I’ve downed in my days (trust me, there have been plenty), the meat in this one was definitely the best. Sorry, Mom. 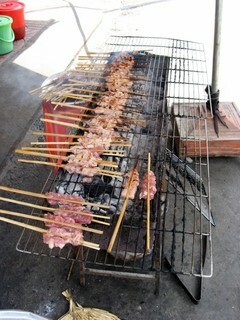 Marinated in sugar, garlic and fish sauce, the flavors permeated the pork and caramelized to perfection on the hot grill. The ratios of meat to fat and charred to cooked was also just right. The banh mi hap arrived soon after. 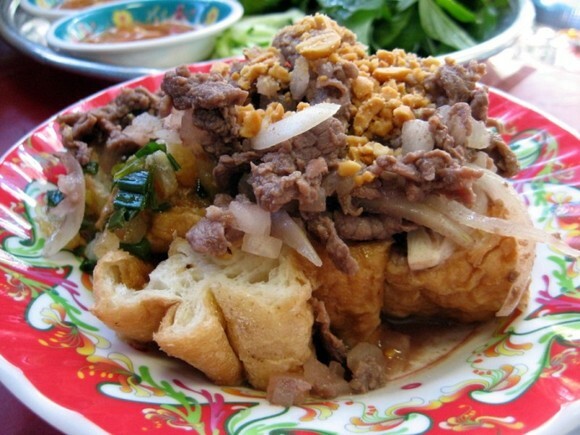 Thick slices of day-old bread came topped with thit bo xao—thinly sliced beef and onions sauteed in garlic and fish sauce. The bread soaked up the meaty juices like a deconstructed French dip sandwich. The banh mi hap was served with herbs, large romaine lettuce leaves and nuoc mam for rolling and dipping, but I preferred to eat it au naturale to fully taste the beef, onions and bread. Hearty and delightful, I’m surprised there aren’t more dishes in Vietnamese cuisine that make use of stale baguettes. you should try ban’h mi` to^m chie^n (fried bread stuffed with shrimm). They use stale baguetts in that dish too. Oh my! 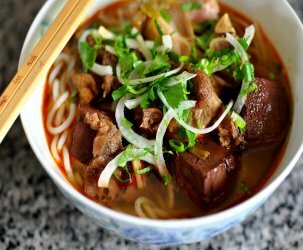 That bún thịt nướng is mouth-watering. This is bordering on torture! Bún thịt nướng for less than 1 dolla, I would holla! Tia – I am most certain you can whip up an equally scrumptious bowl with your mad cooking skillz. Trinh – I’ll admit it, I am spoiled over here. Holla! 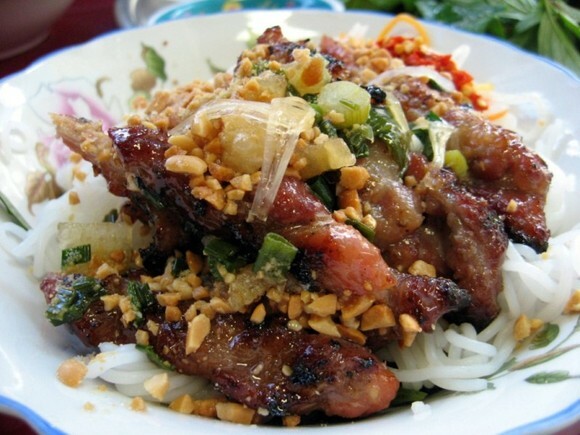 Foodhoe – head to San Jose for amazing Vietnamese food. My aunt in Los Gatos took me out for some broken rice (com tam) a few years back and it was GOOD. mouth-watering!! **slurp..slurp**am not so familiar with Vietnamese cuisine though..how is it different from other Asian cuisines? are Vietnamese fond of spicy food too? 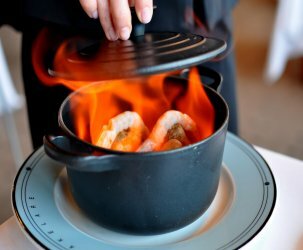 Where were you when you tried these dish? Did you dine in a small tavern along the street? 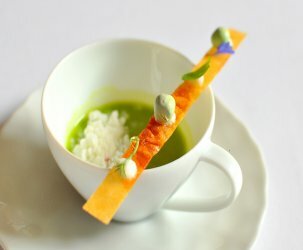 How you described the dish, I get the impression that you were in a restaurant..those fine-dining type restos.. 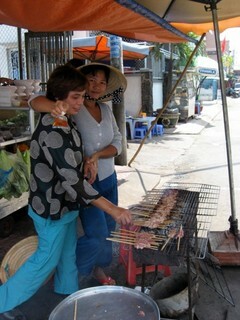 The meat must be so good..and juicy..yummy!! I had the Bún thịt nướng there for lunch today and it was delicious! Total came to 45,000 VND with a 7up.